Seldom given their due as one of the great classic British progressive rock bands, Camel produced some sublime work in their peak years, which intersected with Dark Side-era Floyd and the Peter Gabriel-fronted Genesis. 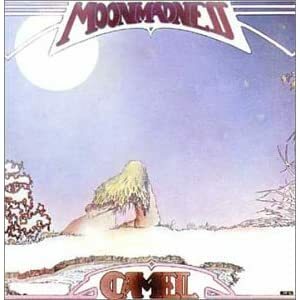 Moonmadness, Camel’s fourth LP and the last by their classic lineup (Andrew Latimer, guitar/vocals/flute; Peter Bardens, keyboards; Doug Ferguson, bass; Andy Ward, percussion) doesn’t boast the eccentricities of early Genesis or the druggy, languid, exquisite despair of Dark Side of the Moon. But this record stands alone in its gently intoxicating jazz rock fusion, a sound that evokes the grandeur of the ethereal and the celestial. Camel could rock, but most of this album was given to creating a downysoft bed of music textures, a fertile sound scape for the listener’s imagination, a magical musical dream. Moonmadness lends itself to active or passive listening. This album’s soothing sound makes it one of my favorite things to fall asleep to. But it’s a layered collage of excellent musicianship for the engaged listener to appreciate. Latimer’s guitar playing is tasteful and impeccable–he’s really one of 70’s rock’s unsung guitar heroes. And once drummer Andy Ward’s tasty embellishments coax you to follow the drum track through “Song Within a Song” and “Another Night”, you’ll never be able to unhear it. We should own music for every occasion and mood we cycle through in life. This isn’t dance music, workout music, or music to motivate you as you clean your house. But for the pensive Sunday afternoon, for the walk under starlight, for the minutes before you drift off to sleep, Moonmadness is the ideal thing. If you’re acquainted with the iconic 70’s art rock albums and want to go a little below the surface of the genre, give this one a fair listen. It might be that lost masterpiece that’s awaited your discovery.